Sime Spitzer was Secretary General of the Federation of Jewish Communities in Yugoslavia. He used JDC funds to assist thousands of Jewish refugees who arrived in Yugoslavia from Austria and Germany. In 1940-1941, he supported a large group of refugees stranded in Kladovo on their way to Palestine. Spitzer continued his work with refugees even after the German occupation of Yugoslavia in April 1941. He was murdered in October 1941 at the infamous Banjica concentration camp located on the outskirts of Belgrade. Sime Spitzer was born in Djakovo/Dakovo, Austria-Hungary (now Croatia) on October 18, 1892, the son of Ya’akov and Linka. He was married to Julie Lutzer and lived in Belgrade. According to a Page of Testimony submitted to Yad Vashem by his sister, Zlata Weiss, Spitzer and his wife had three children. His daughter Miriam, age 9, is listed as having perished in the Holocaust. From his early youth, Spitzer played an active role in Zionist and other Jewish organizations. 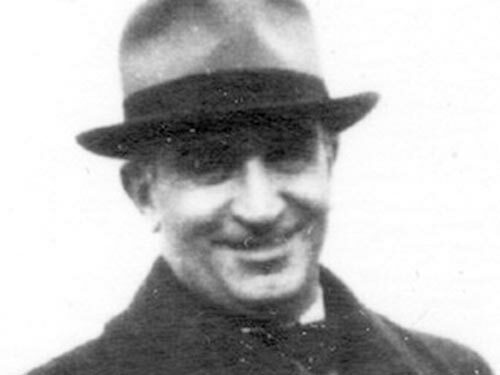 Towards the end of World War I, he co-founded the Federation of Jewish Communities in Yugoslavia – the central body of the Yugoslav Jewish community. In 1937, he was elected Secretary General of the Federation. Spitzer’s exceptional organizational skills became evident when he headed the refugee relief committee in Belgrade. In this capacity he received aid from the Joint Distribution Committee to help thousands of refugees from Austria and Germany who reached Yugoslavia in the 1930s. The numbers cared for officially in 1939 came to 11,200. In addition, under his leadership, aid was provided to the over one thousand refugees on three boats, who were trying to reach Palestine through illegal immigration via the Danube River. These refugees, mainly from Germany, Austria and Czechoslovakia, were stranded in Yugoslavia in what became known as the Kladovo Affair. Attempts to help them continue on their way were frustrated and blocked by many factors. On December 31, 1939, the ships carrying the refugees were directed to a winter harbor in the city of Kladovo when the Danube river froze. In September, 1940, the group was moved to the Serbian town of Sabac on the Sava River. Under the leadership of Sime Spitzer, ongoing aid was provided to the group. He saw to it that they were housed and fed and intervened with government officials to enable the refugees to extend their stay in Yugoslavia. The JDC played a vital role in maintaining them and, together with other Jewish organizations, subsidized the attempt to lease ships to enable the refugees to continue their journey to Palestine. Sime Spitzer worked tirelessly to protect the Jews in his care. He took turns with two others staying with the refugees in Kladovo and Sabac, thus providing them with a link to the outside world. The three organized the various services that the village provided for the group, transferred the necessary funds to buy food, forwarded mail, and maintained contact with the Palestine office in Zagreb. Spitzer tried desperately to obtain passage for the Kladovo group on a ship and immigration certificates, so that the refugees could proceed legally to Palestine. He was forced at times to act without knowing all the facts, to make complex decisions, and to serve as bearer of bad news to those in his charge. Most of the refugees in Kladovo-Sabac were murdered after the Germans occupied Yugoslavia in April 1941. Only a handful survived the war. In October 1941, Sime Spitzer was murdered at the infamous Banjica concentration camp located at a former army base on the outskirts of Belgrade. Spitzer was survived by his wife, who settled in Israel. Arolsen documents. Bauer, Yehuda. American Jewry and the Holocaust: the American Jewish Joint DistributionCommittee, 1939-1945. Jerusalem: Hebrew University, 1981. JDC Archives, AR 33/44, file 1057. JDC Archives, Saly Mayer Collection, file 31. Ofer, Dalia & Hannah Weiner. Dead-End Journey. Translated from Hebrew by Anna Barber. New York, 1996. Pinkas Hakehillot – Yugoslavia. Zvi Locker, ed. Jerusalem: Yad Vashem, 1988. [Hebrew] Yad Vashem – Page of Testimony.